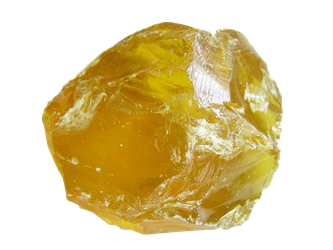 Rosin, also called colophony or Greek pitch, is a solid form of Pine oleoresin from pine trees, mostly conifers, produced by heating fresh liquid resin to vaporize the volatile liquid terpene components. It is semi-transparent and varies in color from yellow to black. At room temperature rosin is brittle, but it melts at stove-top temperatures. It chiefly consists of different resin acids, especially abietic acid. 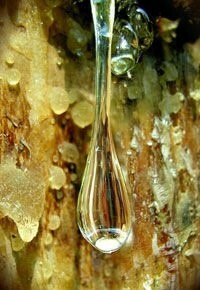 Rosin was identified as gum rosin, wood rosin, tall oil rosin. The production of rosin is 1,270,000 metric tons on 2011. As the data of 2011 from Gum rosin from Forcast, China contributed 68% of production, and wood rosin from and tall oil rosin from EU and USA were contributed 1% and 31%. Gum rosin appears yellow color such as the picture in the right. In China, they were produced from Pine oleoresin of pines. The species of pine tree include P.massoniana, P.yunnanenisis and P.elliottii. Main forest areas on provinces of Yuanan, Guangzhou, Fujian, Jiangxi and Sichuan, southern of China. Chinese gum rosin based products are used for the manufacturing of paper, paint, soap and printing ink. Since rosin is easily softened and oxidized, in the oil paint industry, the carboxylation reaction of resin acid is usually employed to produce resinate for further use. 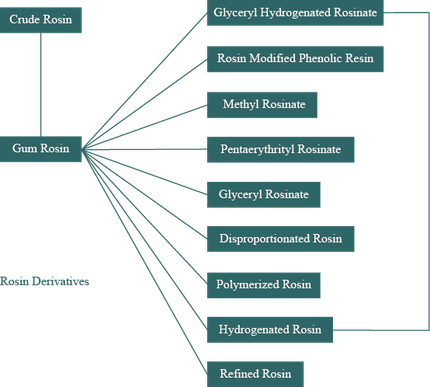 While in the producing of synthetic rubber and printing ink, resin acid is changed into disproportionate rosin, polymerized rosin, hydrogenated rosin, etc for further use by its double bond reaction. Gum rosin is an organic compound of monoterpene, turpentine and resin acid. Monoterpene is compounded by α-Pinene, β-pinene, camphene, myrcene, carene, dipentene, β-Phellandrene and other monoterpenes. Resin acid is compounded by levopimaric acid, palustric acid, abietic acid, neoabietic aicd, dehydroabietic acid, pimaric acid, isopimaric acid, sandaracopimaric acid, dicarboxylic acid and abietic type acid. You can learn the compound on the different of species of pine trees here. Gum rosin is a kind of crude raw material, has the weakness in high acid value and deep yellow color. It is not suitable for manufacturers applied gum rosin in adhesive and coatings formulas directly. The modification of gum rosin mainly have hydrogenation, esterification, disproportionation, polymerized and glycerol. We can call the modified rosins as Rosin Derivatives. As the different preparation of specialty processing, they can identified as Modified Rosins, Rosin Esters, Modified Rosin Phenolic Resins. They are have widely application for adhesives, coatings, inks, paints, paper making, food and beverages, personal cares industries. Rosin was widely used as an ingredient of some kind of adhesive; especially in heat melt adhesive, pressure sensitive adhesive and rubber adhesive. Rosin mainly is used to enhance the strength, plasticity and viscosity of adhesive. Rosin can be converted into abietylamine acetate for killing algae, bacteria, mildew, mollusk and others pest. Rosin mainly is used as concrete frothing agent and floor tiling adhesive. Rosin is used as insulation material in electric equipment industry; China has long history of applying rosin as insulation material in cable industry. Rosin also can mix with bakelite and others artificial resin to soak and besmear electric loop. Abietic acid is the main ingredient of rosin, it can be synthesized with others matter to produce series optics reactive materials and biotic reactive materials; these materials have special function for human and others organism. Rosin firstly converted into hydrogenated rosin, and then used to produce chewing gum. Rosin mainly is used as solding aid and metal polishing agent. Rosin is a kind of weak acidity matter, it can remove oxidation film from metal surface and slightly erode the surface of metal, and therefore, lots of solding aid agents contain rosin. Rosin is a basic material for paint industry because rosin is easy to dissolve in alcohol, gasoline, turpentine and others organic solvent. Rosin always is converted to resinate, and then refine with drying oil such as tung oil and mix with volatility solvent to produce various lacquers. Rosin also take important role in producing road coating, rosin firstly converted to rosin malefic ester or polymerized rosin or disproportionated rosin Polyols ester, and then used to make thermoplastic coating for road sign inunction. Most rosin was applied to papermaking industry as sizing agent. Rosin paper sizing agent can prevent printing oil soaking and dispersing from paper, improves the strength and smoothness of paper; enhances the anti-abrasion of paper. But crystal rosin is unfit for making paper sizing agent due to difficulty of saponification, subsequently makes spot on the paper; sometimes even makes the pipe jam in paper sizing agent producing. Rosin mainly act as color carrier and enhance color adhesive ability in printing ink. It takes about 7% of quality of printing oil in China. Rosin is converted into modified phenolic rosin with softening point of 160 to 175 Celsius degrees and below 20 acid value when it is used in offset printing ink producing. In photogravure printing ink producing, rosin firstly is converted into metal salt rosin with softening point of 125 to 135 Celsius degrees and below 95 acid value. For polymerized rosin, it can be used to producing various special printing ink. Rosin always replaces a part of grease to produce soap because rosin has similar character with fatty acid and cheaper than fatty acid; but the consumption decline gradually in recent year. Rosin is used as softener in synthetic rubber industry; it enhances the plasticity, tear strength, heat resistance, flexibility and anti-abrasion of synthetic rubber; also rosin can be use as dispersant and emulsification in synthetic rubber industry. After seventies of twenty century, about 20% of total annual output of rosin was used synthetic rubber industry.